Today, I am thrilled to introduce Jayne Cohen as my guest blogger! 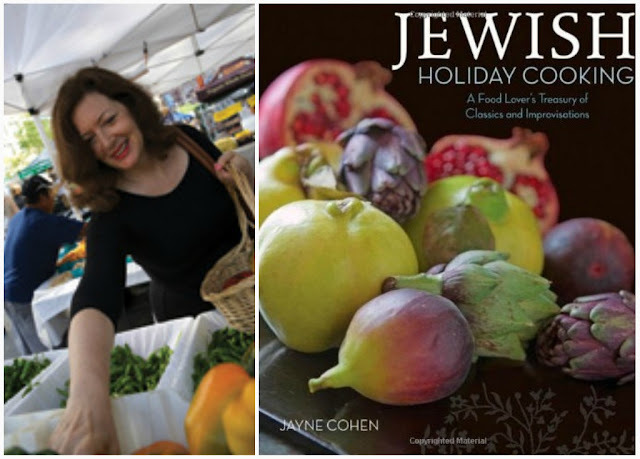 Jayne’s newest book, "Jewish Holiday Cooking" was named a 2009 James Beard finalist in the International Books category. To make your holiday even more special, be sure to have some of Jayne's offerings on your table. They decide on a special fruit from this harvest season and refrain from savoring it, so that when they bite into it at last on Rosh Hashanah, it will taste new and sweet: an edible metaphor for a fresh new start to a sweet year. It’s an edible metaphor in another way too. Rosh Hashanah, which celebrates the beginning of the Jewish calendar is also, by tradition, the anniversary of creation. Tasting a fruit not eaten since it was last in season is like discovering it, and so participating, at least through our senses, in the brand-newness of creation. Living close to New York City’s Union Square Greenmarket, I am assaulted after summer vacation by the winy autumn smells, and every year, like a kid at a candy counter, I find it more difficult to select one “new” fruit that we will relish at our holiday table. 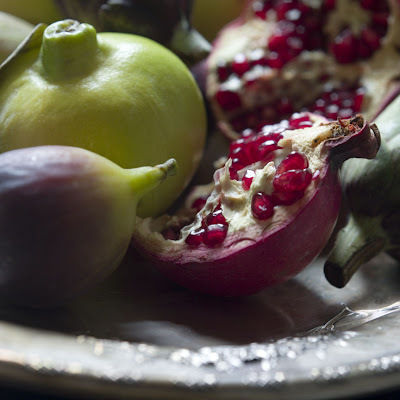 And so for Rosh Hashanah this year, which in 2011 begins Wednesday evening, September 28th, I am sharing a menu with Design Megillah that features a lovely fall fruit for each course. Below you’ll find three different “new fruit” recipes: Brisket Braised in Pomegranate Juice with Onion Confit--layered with tart-sweet flavors and autumn colors; a tangy Moroccan Carrot Salad, set off with black grapes; and a simple Hungarian Plum Tart that’s like a cross between a crunch and a crumble. Fish, symbolizing fertility and an abundance of blessings, is a customary first course. How about a kosher riff on the Italian classic, prosciutto and figs: ripe figs draped with thinly sliced smoked salmon or smoked poultry? Dribble lightly with a bit of good balsamic vinegar, if you like, and serve on a bed of arugula. Nearly 2500 years ago, the prophet Nehemiah proposed that on Rosh Hashanah, we "eat the fat and drink the sweet." Chopped chicken livers, creamy with caramelized onions, served alongside grilled figs or prune-plums, or black grapes stewed into a light, spiced compote, and accompanied by a glass of Sauternes, Moscato d'Asti, or Gewurztraminer would fit the bill nicely. 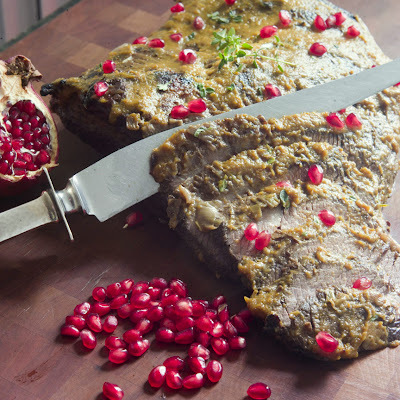 Savory lamb tagine or braised duck with quinces or pears, or chicken cooked Mediterranean-style with figs, apricots, and tomatoes would make a main course in keeping with the season if you're not preparing the brisket with pomegranates. Roasted Bosc pears add a buttery richness to many foods. They would make an excellent addition to a pureed butternut squash soup or a side dish of the vegetable. Or tuck roasted pear slices into a butter leaf salad, sprinkle with pomegranate seeds and marcona almonds or toasted walnuts, and dress with walnut oil and a fruity vinegar. And the early fall produce so plentiful at the markets right now will inspire lots more ideas for a joyous, "fruitful" new year. Prepare brisket: heat oil over medium-high heat in large heavy-bottomed roasting pan, using two burners, if necessary, or in wide 6-quart Dutch oven or flameproof casserole. Add brisket, and brown well on both sides, about 10 minutes. Transfer brisket to a platter and set aside. Alternatively, you might find it easier to sear meat under broiler. Just cover broiler pan well with foil to minimize cleanup. Preheat broiler. Place brisket under broiler, fat side up, and broil for 5 to 6 minutes on each side, or until nicely browned. Move meat around as necessary, so it sears evenly. Transfer brisket to a platter and set aside. Pour off all but about 1 tablespoon of fat remaining in pan (or heat 1 tablespoon of oil if you broiled brisket), and add onions and leeks. Cook, stirring occasionally, over medium-high heat, until vegetables are softened, 5 to 7 minutes. Add garlic, carrots, and celery, and continue cooking until onions are golden, 7 to 10 minutes, stirring and scraping pan to prevent scorching or sticking. Add 1 cup pomegranate juice and bring mixture to a boil, scraping up browned bits from bottom of pan with a wooden spoon, until liquid is reduced by about half. Add remaining 1 cup juice, broth, thyme, rosemary, and bay leaves and bring mixture to a simmer. Season to taste with salt and pepper. About an hour or so before you are ready to serve brisket, make confit: in 10- to 12-inch heavy skillet, warm oil. Add onions, season lightly with salt and pepper, and toss to coat with oil. Cook, tightly covered, over lowest heat, stirring occasionally so mixture does not burn, for 1 hour, or until onions are very soft and pale gold. Add additional salt and pepper to taste, broth, and wine. Raise heat and boil mixture, uncovered, stirring, until all liquid is evaporated and onions turn golden. Taste and adjust seasoning (it may take quite a bit of salt), and turn off heat. Cover mixture and keep warm. Stir in pomegranate seeds just before serving. Scrape off all solid fat from brisket. Remove meat from pan and slice thinly across the grain. Prepare gravy: bring braising mixture to room temperature, then strain it, reserving vegetables. Skim and discard as much fat as possible from the liquid. Puree reserved vegetables and 1 cup of the defatted braising liquid in food processor or blender. Transfer pureed mixture and remaining braising liquid to a skillet, and reduce gravy over high heat to desired consistency. Taste for seasoning. Rewarm brisket in the gravy until heated through. Spread onion confit over a serving platter and arrange sliced brisket on top. Ladle hot gravy over meat and serve immediately. Prepare the dressing: in a large bowl, whisk together oil, lemon juice, garlic, cumin, paprika, mint (crumble it, using your fingers), cinnamon, coriander, and salt, pepper, and cayenne, if using, to taste. Grate carrots coarsely in food processor or over largest holes of box grater. Cook them in lightly salted boiling water until just tender but still crisp. Drain them (the liquid would be a nice addition to vegetable stock), and while still warm, toss them with the dressing. Add grapes and walnuts, if using, and toss again. For best taste, let the flavors marry for at least a couple of hours. Taste and adjust oil, lemon juice, or seasoning, if needed. Sprinkle with cilantro just before serving, if desired. In greased 13 by 9-inch baking dish, arrange plums cut-side up in a single layer. Stir together brown sugar, 3 tablespoons flour, and cinnamon in a small bowl, and sprinkle the mixture over plums. In large bowl, using a fork, blend together granulated sugar (use up to 2 tablespoons less than 1 cup if you prefer, as I do, a less sweet dessert or if plums are particularly sweet), remaining 1 cup flour, baking powder, salt, egg, and almond extract until mixture resembles coarse meal. Crumble it over plums. Drizzle melted butter or margarine over all and bake tart in middle of oven for 35 to 45 minutes until plums are tender and topping is golden. Serve tart at room temperature, accompanied by sorbet, ice cream or whipped cream, if desired. It is also wonderful warm from the oven, especially with the cool contrast of ice cream.